This page reproduces some of the principal media coverage of Lafarge's decision to withdraw from the Harris superquarry proposal. Photos have been interwoven with some of the text. Where these are not from the original newspaper article I have stated so. Controversial plans to develop the UK's largest superquarry on a small Scottish island have been scrapped. French company Lafarge Aggregates yesterday revealed it had ditched proposals for a 600-hectare quarry at Lingerbay on Harris - 13 years after submit-ting the planning application. The decision, which was widely welcomed by politicians, local residents and environmental groups, ends lengthy speculation about the project. Lafarge submitted its original planning application in March 1991 to extract anorthosite over a 60-year period for use as construction aggregate. Western Isles Council approved the plans in 1993 but the application was called in by the secretary of state in 1994. A year-long public inquiry ended in 1995 but the report was not completed until 1999. Although it favoured approval, ministers refused the application in 2000, saying the economic benefits failed to out-weigh the environmental impact. But multinational Lafarge pursued the matter. It launched a legal battle after doubts were raised about planning permission granted for the site by the now defunct Inverness County Council in 1965. Late last year, ministers threw out the legal bid. Lafarge fought on, asking the Court of Session to overturn the decision. However, the appeal was rejected in January and the company yesterday confirmed it was withdrawing completely from the project. Western Isles Council's chairman of environmental services, Angus Nicolson, said the uncertainty had damaged the economic prospects of Harris and the surrounding areas. But he added: "I am grateful that Lafarge has now brought an end to that uncertainty. "For the future of an area to hang in the balance for 13 long years, with the consequent disincentive to other potential businesses, is, frankly, nothing short of a disgrace." Local councillor Morag Munro said: "There will be mixed feelings. Those who were concerned about the effects of the development will be relieved, while those who believed it would be of benefit to Harris will be disappointed." Friends of the Earth Scotland chief executive Duncan Mc-Laren said the decision would secure the island's future. He said: "This is a great decision for the people and environment of Harris. After a decade of waiting, finally environmental justice has been delivered for the people of Harris. WWF said the decision would end years of uncertainty for local residents. RSPB Scotland spokeswoman Anne McCall said: "After over a decade of controversy we welcome the announcement made by Lafarge." A spokeswoman for the Ramblers Association of Scotland said: "We are delighted with Lafarge's announcement. It lifts a dark cloud that has hung over the Western Isles for over years." Donnie Macdonald, owner of Rodel Estate where the quarry development was planned, and Ian Wilson, who holds the mineral rights for Lingerbay, refused to comment. However, the chairman of the Coastal Quarry Local Supporters Network, John Macleod, said: "The decision to pull out is so disappointing, particularly for Harris. We are losing in excess of 200 jobs, a royalty of 3p per tonne for a community fund, and losing wages in excess of £3million a year." Highland Green MSP Eleanor Scott said: "At last the years of uncertainty have ended and the long shadow cast across the Western Isles by this unjustified and unsustainable project has been lifted. Lafarge fought a strenuous campaign for the superquarry but at last justice has prevailed." Norman Macleod didn’t hear the little piece of history that had just been announced in the Harris Hotel in Tarbert because he was, in his own words, “very old and very deaf”. But when the chairwoman explained it to him, his reaction was memorable. The retired policeman slowly put his huge hands together and started clapping. Like all the other islanders in the room, he was overcome with relief. A long, painful saga was at last at an end. It was, by any standards, an extraordinary occasion. Three senior executives from one of the world’s biggest corporations flew in from Paris by private jet to announce that they weren’t planning any business. In fluent English they talked about respect – for the local community, for the environment and for people – and in a few minutes ended 13 years of blight and conflict. Against the background clatter of hotel dishes being washed, they were warmly thanked by both those who had opposed and those who had supported the superquarry. Lafarge’s decision to withdraw from Harris brings to a close one of Scotland’s most prolonged environmental battles. It also rewrites the ground rules for global environmental politics, and gives real meaning to the much-abused mantra of corporate social responsibility. The inside story of how the company came to make its decision is as remarkable as the event itself. Warring business executives, environmental organisations and islanders all played a crucial role, politely prodded by a spiritually-minded deep-green campaigner and TV game-show winner. The application for planning permission to dig Britain’s biggest quarry near Lingerbay in southernmost Harris was first made by a UK firm, Redland Aggregates, in 1991. The idea was to carve out the side of the mountain of Roineabhal to extract up to 600 million tonnes of rock over 60 years for building roads and railways across Europe. at Rodel, from the southern flank of Mt Roineabhal. Photo: Alastair McIntosh (not part of Sunday Herald article). At first many islanders thought it was a good idea that would bring jobs and wealth to a remote rural community, and it was approved by Western Isles Council. But as details of the £70 million plan emerged during a 100-day public inquiry in 1994 and 1995, most changed their minds. A 62% majority in favour of the superquarry turned into a 68% majority against it, and the council abandoned its support for the scheme. More than anything, it was the gigantic scale of Redland’s plans that worried people. At the end of its life, the quarry would leave a crater one kilometre wide and two kilometres long, stretching 180 metres below sea level. The scar on the landscape in a designated National Scenic Area would be six times the height of the White Cliffs of Dover. In 1997, after its share price plummeted, Redland became the victim of a hostile takeover by Lafarge. But the Harris superquarry saga rumbled on, dragging the company, the Scottish Executive, ministers and the court of session into a series of increasingly byzantine confrontations. Throughout, though, there was never any sign of wavering by Lafarge. By legally challenging the Executive’s decision to refuse planning permission, then resurrecting and going to court over a separate quarrying consent from 1965, the company looked like a dog that was determined to hang on to its bone. Even as recently as January, after the Sunday Herald discovered that three Lafarge executives from Paris had paid a secret fact-finding mission to Harris, the company’s Scottish spokesman adamantly denied that they were having any second thoughts. But, as events have now demonstrated, they obviously were. Lafarge inherited the superquarry proposal from Redland, and was reluctant to interfere in the operation of its newly established UK business unit. But other circumstances conspired to ensure that the parent company could not ignore the issue. 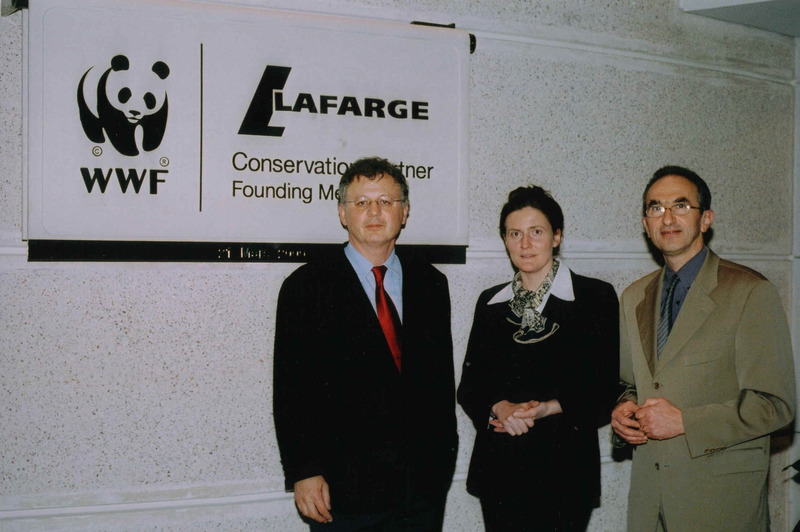 In 2000, Lafarge signed a £3.5m, five-year partnership deal with the global environmental network WWF International, in Switzerland. But as the superquarry had been vigorously opposed by WWF in the UK, it soon became a thorn in the flesh of the partnership. Last year, the Sunday Herald revealed that WWF UK had rejected its share of Lafarge’s millions because of the company’s refusal to cancel the superquarry. The money was sent back by WWF UK’s chief executive, Robert Napier, whose previous job had been as chief executive of Redland. Meanwhile, WWF was also feeling the pressure from other environmental groups, who accused it of selling the credibility of its world-famous panda logo to an environmentally irresponsible company. The panda is proudly on display in the foyer of Lafarge’s Paris headquarters. Friends of the Earth launched an international campaign demanding that WWF pull out of the partnership with Lafarge. Although this soured relations between the two groups, the combination of one agitating on the inside while the other agitated on the outside has proved a winner. “We believe this decision vindicates our tactic of sticking with Lafarge, and arguing from the inside,” said director of WWF Scotland, Simon Pepper. “We have great respect for the somewhat purist approach of Friends of the Earth, but we believe pragmatists are also needed. Along with the pragmatists and the purists, Lafarge also needed a catalyst. This came in the unusual form of a passionate, ginger-bearded quaker with a knack, as he puts it, of being in the right place at the right time. Alastair McIntosh is best known for winning £50,000 last year in a Channel 4 reality TV game show about personal morality called Without Prejudice. But he also has a strong track record as an environmental campaigner, writer and academic, and is a fellow of the Centre for Human Ecology in Edinburgh. Brought up in Lewis, he has fought for years against the superquarry, and over the last six months has played a vital behind-the-scenes role in turning Lafarge round. He was contacted by a French banker who had read his book, Soil And Soul: People Versus Corporate Power. The banker knew someone who knew senior people in Lafarge, so McIntosh was able to fix up a meeting to discuss the superquarry. Last October, he delivered a short presentation on his laptop to company executives in Paris, showing the environmental damage that would be done by the superquarry. 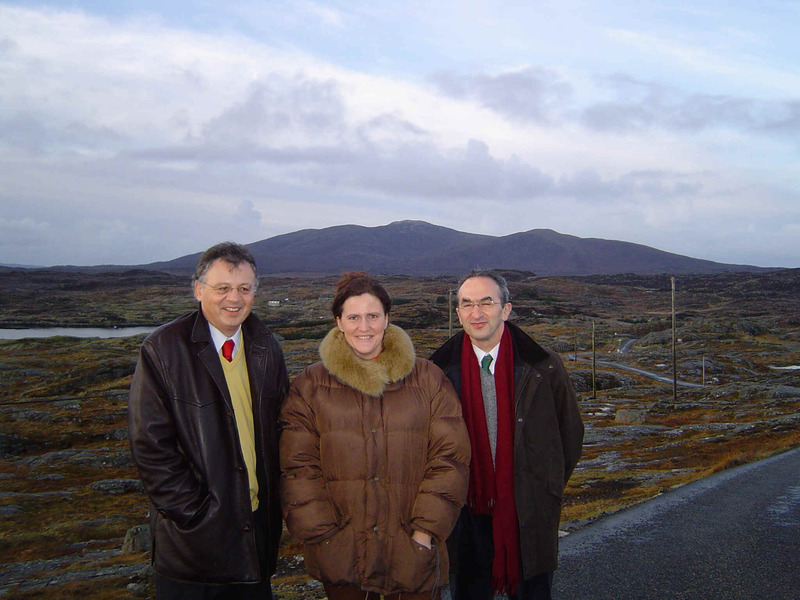 He then arranged for three company vice-presidents – Philippe Hardouin, Michel Picard and Gaëlle Monteiller – to visit Harris and talk to local residents in January. Impressed by what they heard and saw, the trio returned to Paris and convinced the company that it had to withdraw. They then returned to the island on Friday, as they had promised they would, to unveil their decision. Although it was carefully presented as a joint agreement with the UK arm of Lafarge, it was clear that the French parent company had told its British subsidiary what to do. While the French executives talked cheerily of fulfilling their corporate principles in Harris, the two British managers present warned gloomily of the need to find other ways of meeting future demand for aggregates. 15 Jan 2004, with Mt Roineabhal in the background. McIntosh (not part of the Sunday Herald article). Lafarge’s decision was not, of course, entirely altruistic. The economic case for the superquarry was much weaker than it used to be, since annual demand for aggregates in the UK dropped from around 400 million tonnes in the mid-1980s to 270 million tonnes today. Whatever the reasons for Lafarge’s dramatic U-turn, in South Harris this week the wild red mountain of Roineabhal will rise to the sky and catch the eye as it has always done. And the wind will heave a sigh of relief for a landscape that remains immutable. But back in the business world, something has changed. Multinational companies no longer look quite as invulnerable as they did last week, and the balance of power between people, the environment and corporations has shifted – for once in the right direction. 1965 Planning permission granted for a small quarry at Lingerbay in south Harris. 1988 Redland Aggregates starts preparing an application to dig a huge superquarry at Lingerbay to extract anorthosite. March 1991 The company applies to Western Isles Council for planning permission for the £70 million superquarry. June 1993 In a referendum, 62% of Harris residents support the superquarry; Western Isles Council grants it planning permission. October 1994 A public inquiry into the superquarry opens in Stornoway on Lewis. May 1995 In a second referendum, 68% of Harris residents oppose the superquarry. June 1995 As the public inquiry closes, Western Isles Council abandons its support and joins the objectors. The inquiry was the longest in Scottish planning history. December 1997 French multi national Lafarge takes over Redland Aggregates. March 2000 The public inquiry’s report finally lands on new Scottish environment minister Sarah Boyack’s desk. September 2000 Lafarge launches a legal action against the Scottish Executive, alleging that the delay in coming to a decision breaches the company’s rights. It is revealed in court that the public inquiry recommended giving planning permission. October 2000 The court of session rules that the delay is of “scandalous proportions” and orders the Executive to make a decision within 21 days. Boyack is replaced as environment minister by Sam Galbraith. November 2000 Galbraith refuses planning permission arguing that the inquiry “seriously underestimated” the impact it would have on scenery. December 2000 Lafarge lodges an appeal at the court of session. May 2001 Lafarge claims the planning consent issued in 1965 is still valid. November 2001 A five-day public inquiry into the validity of the 1965 consent takes place on Harris. May 2002 The Executive Inquiry Reporters Unit rules that, although the 1965 consent is still valid, it is only for five hectares, not the 600 hectares sought by Lafarge. August 2002 Lafarge appeals to the court of session against the Executive ruling. November 2003 The court of session hears Lafarge’s appeal on the 1965 consent. January 2004 Lafarge’s appeal on the 1965 consent is rejected. April 2004 At a meeting in Harris, Lafarge announces it is abandoning the superquarry. The historian and ex-Crofting Commission chief Jim Hunter is always worth listening to. At a recent conference examining the increasingly well-targeted regenerative powers of the National Heritage Lottery Fund, Hunter gave a moving speech about why the Highland spirit, not just the land, had fallen into decline by way of its inhabitants being made to feel inferior in every way possible. He gladdened the heart, however, with the news of how this process is gradually being reversed, with the healthy repopulation of places like Skye, and community land buying re-empowering people who had previously lived under the anachronistic yoke of feudalism. In a nutshell, he was pointing out that if you make communities feel good about themselves, economic regeneration is almost a given. This came to mind with the news that French corporate giant Lafarge has finally abandoned its superquarry plans for Lingerbay in Harris, and that the magical little peak of Roineabhal has been spared from being blasted apart and having its ancient stones scattered beneath Germany’s autobahns. There is little point in picking over the bones of why the company has arrived at this decision. It matters little whether it was for the environmental reasons it cited, Lafarge being a noisy supporter of WWF, formerly the World Wide Fund For Nature , or whether it was for the more believable reason of some long-term, financially motivated corporate strategy. Whatever the truth, the fact remains that no quarry will be created and the island is back where it started; with a few disappointed citizens who believed the scheme would have brought desperately needed jobs and investment, and a few relieved souls who thought that economic investment would have been minimal but environmental impact catastrophic and irreversible. Now that the decision is final, the question that arises after all these years of anxious debate is what will happen to Harris? Harris is a community in peril. Depopulation has reached crisis point, with the older inhabitants worrying about their uncertain futures on their emptying land, just as the younger ones find themselves forced to leave simply to make a living. Help of sorts has been tried in the past from all manner of government agencies who acknowledge the problem, but the kind of budgets and resources available to such bodies can do little more than stick a plaster on a gaping wound. The people of Harris are now officially calling on the Scottish Executive to help them regenerate the island, putting forward the development of sustainable energy projects and skills for young people as possible priorities. But with Scotland as a whole depopulating, why should we care so specifically about the plight of such a small community? Why not simply view their difficulties in the wider context of how we heal the economic problems of the whole nation? Jim Hunter, I think, has highlighted precisely why we should care. The islands are a special case not only because of the kinds of deprivation they have suffered both historically and more recently, but because an initiative to treat the inhabitants themselves as the main resource is one that could have tremendous implications for us all if it worked. The traditional prejudices that Jim Hunter described – of Highland people being regarded as the instruments of their own fate because of recalcitrant backwardness – is so wide of the mark in the 21st century as to be laughable. I was fortunate enough to be at the launch a few weeks ago of The Connect Women’s Network in Stornoway, a project put together by a group of enthusiastic, high achieving locals, to bring together other like-minded women from all over the islands, to foster an atmosphere of entrepreneurial spirit, of positive and creative thought and to combat the isolation that the geography and sometimes culture of the Hebrides has forced on women. It was inspiring stuff. All ages were represented and what was meant to be a simple presentation about starting a business grew into a lively debate that covered the emotional intelligence of men, the self- deprecating culture of women and how modern society impacts on the confidence of the young. It was brilliant, and the message was clear that this was a group of people determined to make things happen despite the inherent obstacles that life on a remote island presents. Not a trace of recalcitrance. Anything but backward. The image painted by one vile and ignorant commentator back in the 1990s when the quarry debate began, of the islands being full of dour misanthropes waiting for the chance to drive trucks full of stone chips to earn enough money to feed their drink problem, was precisely the kind of insult that Jim Hunter cited as a reason for perpetuating the Highland’s and Island’s lack of self-belief. It’s time, surely, for the Scottish Executive to listen to the people of Harris, and not only respond to their pleas for economic help, but also have the foresight to believe that the people themselves can be the architects of their own recovery. The island is already showing how it understands and controls shifting changes in tourism, its biggest and most important industry, and if the government could only harness this inherent ability to adapt to other economic developments, to fully involve the commun ity and above all trust that they know what they want and how to get it, then there is little doubt that investment would not be wasted. What it would do for the rest of us would send out a message that this government believes in its people, that it knows that inspiring confidence is as important to economics as it is to culture. The repopulation of Harris will not come just by busing in crowds of baffled and disappointed asylum seekers who were rather hoping to settle in Acton, but by helping the people who already live there, and those who would love to voluntarily come and join them, to build and shape the island the way they see fit. The island’s people are considerably more precious than their stones. The sun shone brightly on Harris late on Friday morning, and in more than one sense, big dark clouds had been lifted from over the area. For 13 long years the locals there have had to contend with the uncertainty of the Lingerbay superquarry saga, but at long last, that saga has come to an end. Latterly, barring the sterling efforts of both the pro and anti-quarry lobbies, the subject was something of an anathema to the majority of Harris folk. Not because of an overwhelming opposition to the development, but more so due to a tiredness of the issue whenever it became broached. On one thing everyone is now agreed. No more Lafarge, no more Scottish Executive rejection, and no more Court of Session appeals. At a furtively-arranged meeting in the Harris Hotel on Friday morning, supporters and opponents gathered to hear what had been heralded ‘a major announcement’ by Alistair McIntosh, a land activist who had been delegated mediator between all players. Angus Macleod, (33), a motel manager from Tarbert, had been invited to the meeting having long been an advocate of the superquarry development. In his own words he had ‘not been shocked’ at what Lafarge had to say. “The fact that the quarry isn’t coming disappoints me greatly,” he told the ‘Gazette’. Yet back in 1991, when the quarry proposal was first mooted, Mr Macleod had been against the development. “I was a victim of the scaremongering at the time, having listened to the environmental lobby,” he said. During that research, Mr Macleod had spoken to workers at the Glensanda quarry in Morvern ‘as they were the correct people to speak to’. “They allayed my fears with regard to noise and pollution,” he said. Former councillor and police officer Norman Macdonald, of Finsbay, said he lived one mile from where the proposed development would have been sited. “I’m happy at the announcement, but the whole process has taken far too long,” he said. Mr Macdonald denied claims that an employment crisis beckoned for Harris as a result of Lafarge’s withdrawal. Crofter Norman Macleod, of Leverburgh, (78) has fought the quarry plans ‘from day one’. He sat in on the public inquiry and was not satisfied at what Redlands had to say. “It was quite clear to me that they were going to look after their own and there would be no benefits to the community,” he said. Mr Macleod said that the development would have ‘no benefits whatsoever’ for the people of Harris, and would ultimately have been ‘detrimental to everything’. “The tourist industry can only go forward from here,” he said. But Angus Macleod, while conceding that such a superquarry would not now be situated in Harris, was still defiant. “Sometimes decisions have to made on a community-wide basis as opposed to what might directly affect individuals,” he said. Due to ‘social, economic and environmental’ reasons, Scotland’s longest running planning dispute — regarding the proposed coastal quarry at Lingerbay in Harris — has finally ended. Following meetings with local residents — and after considering the financial and environmental implications — Lafarge Aggregates UK, the world’s largest cement manufacturer, has brought an end to plans for a ‘superquarry’ on Harris. At a short meeting held in the Harris Hotel on Friday, Lafarge confirmed that they were pulling out and that they were abandoning any further legal action to try to win their case. It follows the decision in the Scottish Court of Session (January 9, 2004) to reject its appeal over the extent of the existing planning permission granted in 1965. The company is also withdrawing its outstanding appeal in pursuit of its 1991 planning application. Mr Monteillor said that they had learned that the planning process was going to take years and years, which was neither suitable for themselves or the local community. The quarry project was now ‘completely over’ for the company. Lafarge, however, has stressed that the problem of sourcing medium and long-term supplies of mineral in the UK remains unresolved, which calls for a serious public debate about where the building materials of the future will come from. Following the decision, Comhairle nan Eilean Siar’s chairman of environmental services, Cllr. Angus Nicolson, commended the company ‘for their respect to the people of Harris in coming to the island to make this announcement’. He said: “The uncertainty that has surrounded this issue since way back in 1991 has done nothing but harm to the economic prospects of Harris and the islands and I am grateful that Lafarge has now brought an end to that uncertainty. She added: “Harris has been designated a National Scenic Area and no-one will dispute the beauty of our scenery and the value of our culture and way of life. The Government who recognises this must also recognise that such an area needs and deserves their support to be sustainable. I will be making a strong case to the various agencies and particularly to the Scottish Executive to this end. The process was an education for our community. It encouraged debate, raised issues, gained confidence and was the launch pad for other developments. For example Harris Development Ltd, which has achieved a great deal since its inception, owes its beginnings to the quarry debate. Meanwhile, an ‘end to the uncertainty’ was welcomed by Harris Development Ltd.
united in its desire to develop a better future for the island. HDL is confident that the people of Harris can work together successfully for the betterment of the community, just as directors of HDL with differing opinions on the quarry proposal have been able to work together for the last 10 years on a range of community development projects. Editorial, West Highland Free Press, 8 April 2004. It is probably best that the Lingerabay quarry application should be given a decent burial and a line drawn under a saga from which none of the major players emerges with any credit. The project was too big, the opposition too selfish and the process far, far, far too long. The biggest losers from the twists and turns of the past 30 years are the people of South Harris and the Bays - areas of high unemployment and ritual out-migration. Whatever statistics exist today are false because they fail to reflect the number of men and families who have left during these years of waiting, for the want of decently-waged employment. These people were repeatedly duped. The lost villain of this particular piece is Mr Ian Wilson - quarry developer, bankrupt, serial entrepreneur and latterly a landowner in Sutherland. Seldom since the Trading Companies arrived in exotic destinations bearing beads and Bibles has a bigger con-man inflicted himself upon island communities. What the people of South Harris wanted was straightforward - the reopening and expansion of Lingerabay Quarry in a way that would provide perhaps two or three dozen jobs for the male population. What they got was a series of false starts followed, suddenly, by Mr Wilson's deal with Redland to create the biggest hole in Europe. The Free Press has always been generally "pro-Redland" in the sense that we believed the benefits, in terms of employment and economic activity, outweighed the likely disadvantages which were almost certainly exaggerated by people with a vested interest in ensuring that nothing happened. The word "nothing" in such circumstances excludes the aforementioned phenomena of unemployment and out-migration which certainly continued to happen. In retrospect, however, it is pretty clear that the Redland proposal was doomed from the start. These are islands which attract disproportionate interest from environmental zealots and those who aren't here already can soon be contacted by internet. People who had never been near Harris suddenly became international authorities on its best interests. It is an increasingly familiar pattern. The process of planning inquiry, subsequent report and ministerial decision was, of course, a scandal and a disgrace. It took no fewer than nine years for the Scottish Office - by then the Scottish Executive - to produce a decision. One would like to think that these islands would never again be treated with such contempt by the national planning processes but when one looks at the way things are going with the Lewis wind farm applications, there is little cause for optimism. We have no doubt - any more than we did 30 years ago - that there could be a substantial, employment-producing, environmentally-compatible quarrying industry to exploit the unique mineral resources of Lingerabay. We will never understand why, at some stage along the way, Redland or its successor company did not seek a compromise on some more modest development. All of that, however, is now history. The opportunity - or, for some, the threat - has now gone. Never let it be forgotten that so too have many of the people. under the heading, "End of a long campaign", by yours faithfully. This is the text of an address that I was invited to give to Lafarge's European and African management at their "Thinking Beyond" environmental meeting in Bergamo. It received a surprisingly warm response. A number of people came up and said it helped them think more broadly about the issues, and to feel more committed to Lafarge's environmental endeavors. I'm told that two protest rather strongly to senior management, wondering what on earth they were doing letting me loose with such a "one-sided" message. I came away convinced that we need to keep pressure up on such corporations, but that there are many people within them who want us to do this, and who actually rely on us to help hold their ethical polices in place. Interestingly, the subtitle, "Stones and Spirit", was created by Lafarge's Vice President Environmental, Michel Picard, and I had many executives come up afterwards and say how much the valued poetry and spirituality being integrated into their visioning process. Only one came up and said he thought there was no place for "emotional" thinking, as our decisions about the future should be purely scientific and rational. In conclusion, I found the meeting very encouraging, though I was struck by the way the industry is OK about tightening its belt on CO2 emissions etc., but not so good (except in their Gypsum Division) at thinking about trying to reduce overall demand for primary raw materials. An edited version of this text was published in the Sunday Herald (Seven Days), Glasgow, 23 May 2004, p. 9, under the heading, "Integrity of firm caught between a rock and a hard place". I come from the island that is Lewis and Harris in Scotland. I grew up and was educated there. These bones in my body were formed out of the food that we hunted, farmed and went fishing for. 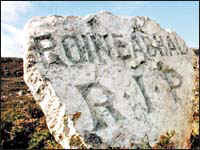 And the first mountain that I ever climbed as a boy was Mount Roineabhal. It was this mountain that in 1991 became the focus for a proposed 600 megatonne “superquarry” – a proposal that Lafarge inherited when it took over Redland in December 1997. I am here today because I played a certain role in defending the mountain. I have written about it in my book, Soil and Soul, a revised edition of which is to be published in French. The way I look at it, quarrying usually has a negative impact on the environment. It extracts a non-renewable resource and does so often from places of great natural beauty. However, we all rely on aggregate. It is not good enough just to blame a corporation like Lafarge that extracts 400 million tonnes of rock each year. It is demand that we all help to create. The argument for the Harris quarry was the presence of high specific gravity white anorthosite with deep-water access, and that it would create jobs. Set against this were many opposing arguments - damage to tourism, access to the prawn fishery, concerns about ballast water introducing translocated organisms, cultural impact, and just the sheer magnitude of what was proposed for one of Scotland’s finest National Scenic Areas. For year after year the arguments for and against the superquarry dragged on. The political delay in arriving at a decision was scandalous to all parties. During this time, Redland was acquired by Lafarge. Eventually, in November 2000, the Scottish government rejected the superquarry application. Lafarge responded by taking legal action. Whilst this was understandable given that the public inquiry reporter had come out in favour, it threatened the island with planning blight for years to come. But then, in October last year, a Paris-based environmental think-tank, the Co-evolution Group, arranged for me to meet some of your senior executives. We had a frank exchange and I came away impressed by their apparent integrity. People like me are understandably suspicious of the possibility of corporate “greenwash”. But in our meeting, I gained the impression that Lafarge’s partnerships with the Worldwide Fund for Nature and the World Business Council for Sustainable Development were of genuine importance to senior management. I reported back to community representatives on the Isle of Harris and told them that Lafarge had requested to make a fact-finding visit. Subsequently, three of your vice-presidents – Philippe Hardouin, Gaëlle Monteiller and Michel Picard, came to Harris on 15th January this year. They saw for themselves how damaging continued planning blight might be for a community so dependent on tourism. On 2nd April they came back with two of their UK colleagues and announced that the legal process would be dropped and the superquarry plans laid down. The long uncertainty for the island was over. We have to create value for shareholders, but we want to do it by respecting some values. The combination of both dictates our decisions. We recognise that if we are acting in the best-possible way from an environmental standpoint, we will get a competitive advantage. Now, I am standing here today because I would like to see delivery on that sort of competitive advantage. Lafarge took a difficult situation but turned it into a victory for corporate ethics. 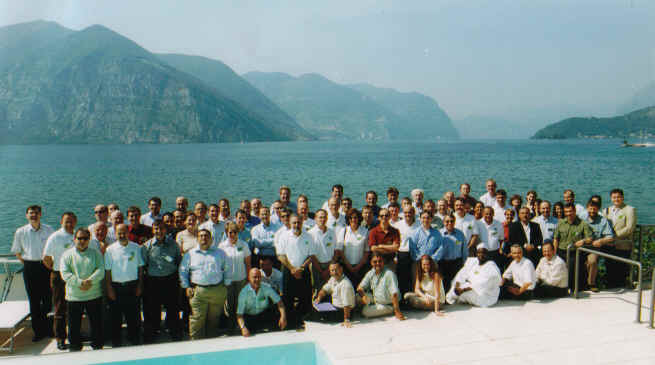 at Bergamo, Italy, 17 - 19 May 2004, for "Thinking Beyond"
conference on sustainability. (Yours faithfully is 2nd from right). I’d like to see the benefits of this cemented in place, for it is not an isolated victory. Indeed, I was delighted to read in The Guardian newspaper recently that Jean-François Sautin, the new head of Lafarge UK, has committed his division to trying to reduce carbon dioxide emissions by 20%. Such ethical measures change what it means to be a corporation. It makes you less part of the problem and more part of the solution. Ethical investors take note! I am certainly not suggesting that Lafarge is now beyond criticism, or that you may never again see the likes of me opposing you! But I am suggesting that you merit recognition for how you laid matters to rest on Harris. You allowed social and environmental considerations to tip the balance of the scales in taking a tough commercial decision. In coming down on the ethical side of the watershed, you have raised standards and so raised the level of the level playing field on which the whole industry competes. But … this achievement in itself is not sufficient. In the long term, the industry must ask how it can move towards a sustainable relationship with the Earth. If I might have your permission, I would like to address this question. I would like to move now into some very deep territory that concerns the source of power and ethics. Today in Britain we consume a massive 5 tonnes of aggregate per head of the population per annum. This is technology and market driven. We didn’t do that back in the days when we had to dig it all out with a pick and shovel. If human beings are to have any hope of being, to use the accountants’ expression, “a going concern” through the fullness of future geological time on this planet, then our present level of natural resource consumption must respect limits. The problem is not so much the management of natural resources as the management of ourselves. Where might we look for motivation to take on such a responsibility? Well, let me offer one suggestion. Many of us will remember our childhood wonder of first seeing minerals and fossils, developing a sense of geological time and fascination with stone. Some of us chose to study geology as a result. That passion, that love, is doubtless what brought some of you into this industry. It is also what can motivate responsibility towards stone, to places of stone and workers with stone. And let me tell you something. There is a special power that comes out of taking up that responsibility. That power helped us to save Mount Roineabhal from destruction. And it is a power that will, I believe, increasingly affect the dynamics of your business – either for the worse, or, if you can continue to be artful, for the better towards a sustainable future. 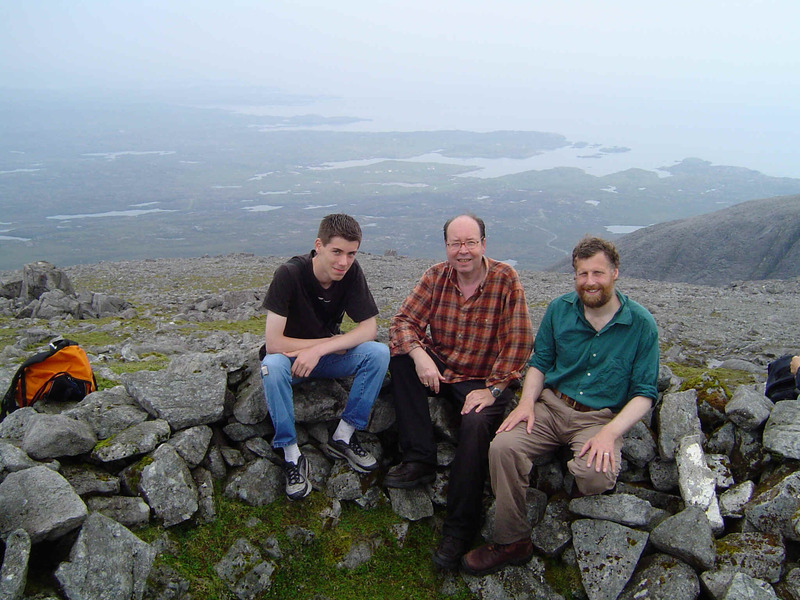 Some of you may have heard how one of the strangest aspects of the government public inquiry on the Isle of Harris was when a professor of theology, a Native American War Chief and myself gave testimony to the spiritual value of our mountain. This, I can tell you, had a subtle but considerable impact on key opinion leaders within the community. And I would like, in a small way, to demonstrate the force of that power to you. Listen please; listen to this fragment of a poetic work I wrote – The GalGael Peoples of Scotland. Rise up from sleep sunk strata beds! Wake up! Wake up! Wake up and waulk this Earth in us! Let me now draw this to a concluding observation. Stone is the bedrock of our human sense of place. As such, we hold it in sacred trust. This does not mean we shouldn’t use stone. Rather, it means we should use it mindfully; for need and not greed. 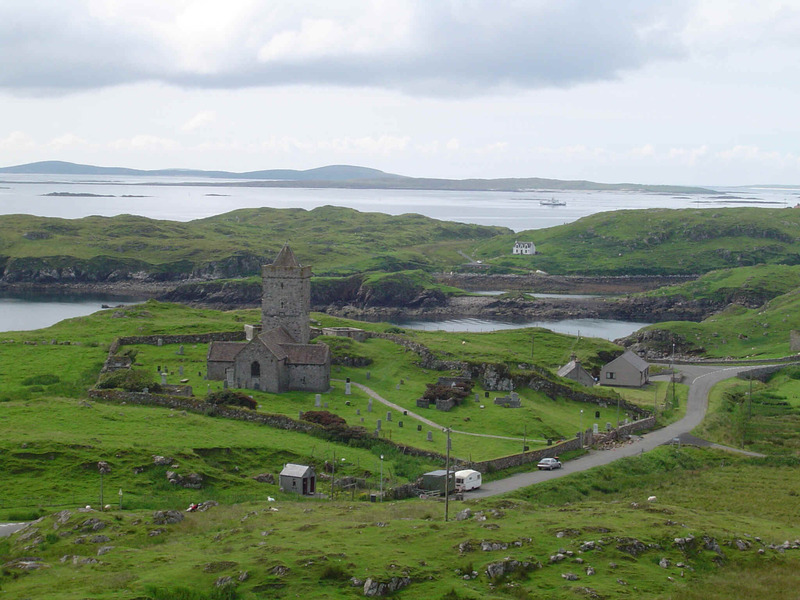 At the foot of Mount Roineabhal on Harris is the medieval church of St Clement. He was martyred as a quarry slave and so became the patron saint of those who work with stone. In this church you see stone used in a long-term sustainable way. It provides both shelter and the beauty that honours mountains and feeds the soul. Now then, during my evidence to the government Public Inquiry on Harris, I made a very peculiar statement. I suggested that quarrying is justified only where it can be undertaken with love – with respect, and even reverence. By positioning Lafarge on the ethical side of the political watershed, raising standards rather than trying to lower them, you nurture this process in the right direction. Asking this might push out new frontiers for your company, perhaps shifting to less reliance on primary aggregate production in your marketing mix and more reliance on finding solutions for a global construction industry increasingly governed by a regulatory environment calibrated for sustainability. Such a vision offers even more than the environmental competitive advantage that Philippe Hardouin has already identified. It would lay claim to a corporate ethos rooted in the bedrock of love; love and all that it implies by way of highly motivated responsibility towards the natural environment, towards communities, and to shareholders and employees. Is there not a special sort of power here? This is the power given to all who seek right relationship in community with one another and the Earth. And think back to precisely who were the founders of Lafarge; to the passionate and spiritually informed social concern that motivated those who have paved the way for you. Would such a corporate ethical vision resting on respect in all its meanings not have their wholehearted … if I might risk using one last spiritual word … blessing? And would you too not feel proud to remain part of such a company, and loyal towards it? Indeed … may all your endeavours in such a direction be blessed. Thank you for listening to me; thank you so very much.